One last night of freedom led to one hang-over from Hell. 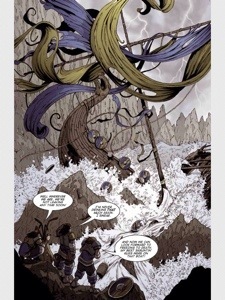 Village Chieftain-to-be Skragbeard, his best man Andersen and future brother-in-law Gunnersen are the only survivors when their boat is shipwrecked during a violent storm on their return from Skragbeard’s stag party. Something slightly different from Tabella Publishing here with a series rather than one of their excellent graphic novels. The serial of this does not detract from the story telling in this first issue. There is enough to keep you interested. There are enough hooks here to keep you interested and want me to read issue 2. What happened on the stag night? Who are the invaders? and what happens with Skragbeard’s wife to be? The art is incredible, with some brilliant wide screen full pages – like above – and some really nice tight scenes which mix in nicely with the crisp art. You really get that Nordic feel to the story! 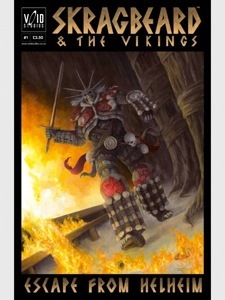 The only recent Vikings I’ve seen are when my daughter watches “Dragonriders of Berk” with my daughter, but this is a welcome edition to the genre and worth picking up!